Two little boys who lived just 50 miles apart. The same age and sadly, the same cause of death. These two death certificates tell of the very sad deaths of William A Pepperney and William Groucutt Jr.
William Groucutt and William Pepperney were born a few months apart. They were both no doubt the apple of their parents eyes. They were the first son in each family, expected to carry on the family name. Sadly, it was not meant to be. After a brief illness, both died from what is today a very manageable disease – pneumonia. William A Pepperney was born on 26 December 1919 to Andrew and Magdalena Pepperney. He is my first cousin, three times removed. The Pepperneys lived, ironically, on Lowrie Street, in the Troy Hill neighborhood of Pittsburgh. Andrew was a pipe fitter and Lena kept the house. William was their second child, following a daughter Savilla three years prior. At just 15 months, Andrew contracted pneumonia. It probably started as bronchitis or influenza however this was before antibiotics could have provided any relief. Antivirals and vaccines to treat or prevent the flu did not yet exist either. According to the death certificate, Wiliam Pepperney was attended to by Doctor J.F. Thomas from 29 March until his death on 31 March. He had probably been ill for days prior but it finally reached a severity where his parents felt the need to contact a doctor. At 2:30 p.m. in 31 March, 1921, little William died of complications from pneumonia. This no doubt was devastating to his family. He is buried in Most Holy Name Cemetery in Troy Hill. Just 50 miles away in New Castle, Pennsylvania lived the Groucutts. William and Tillie Groucutt had two daughters before William Jr was born on 29 February 1919. William Jr is my first cousin, twice removed. William Sr. worked in the steel mills while Tillie was a homemaker. Tragically, William Groucutt would not live to see his first birthday. Sometime in late January he probably contracted influenza or bronchitis. By 2 February, his symptoms were so severe as to warrant a doctor’s attention and Doctor Davis was called. Sadly, on 3 February he too would die of pneumonia. William was buried at Saint Mary’s Cemetery in New Castle on 5 February 1920. He was only 11 months old. 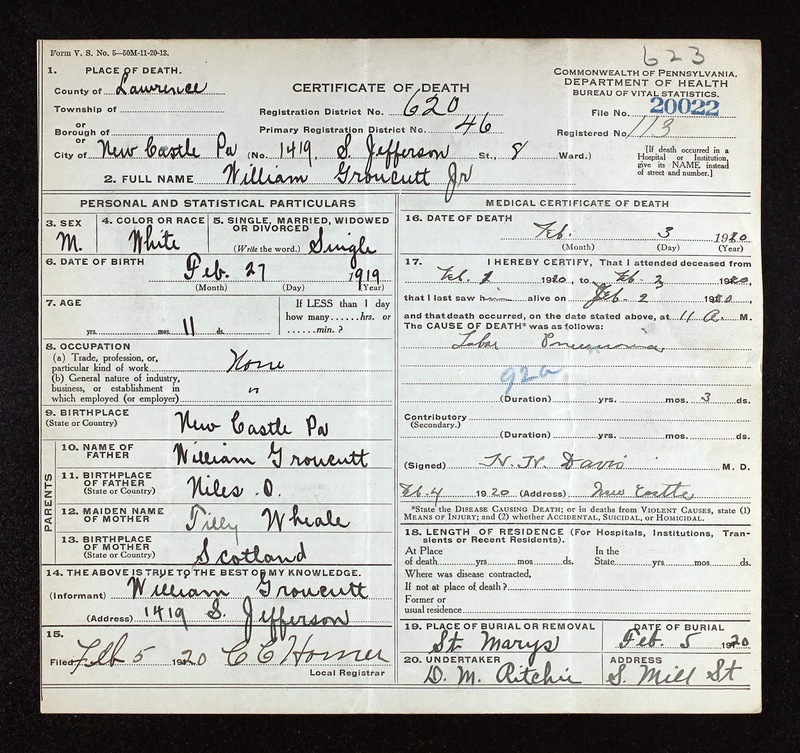 Pennsylvania Department of Health, “Pennsylvania, Death Certificates, 1906-1944,” database, Ancestry.com (http://www.ancestry.com: accessed 19 Oct 2014), entry for William A Groucutt, record 20022 (3 Feb 1920). 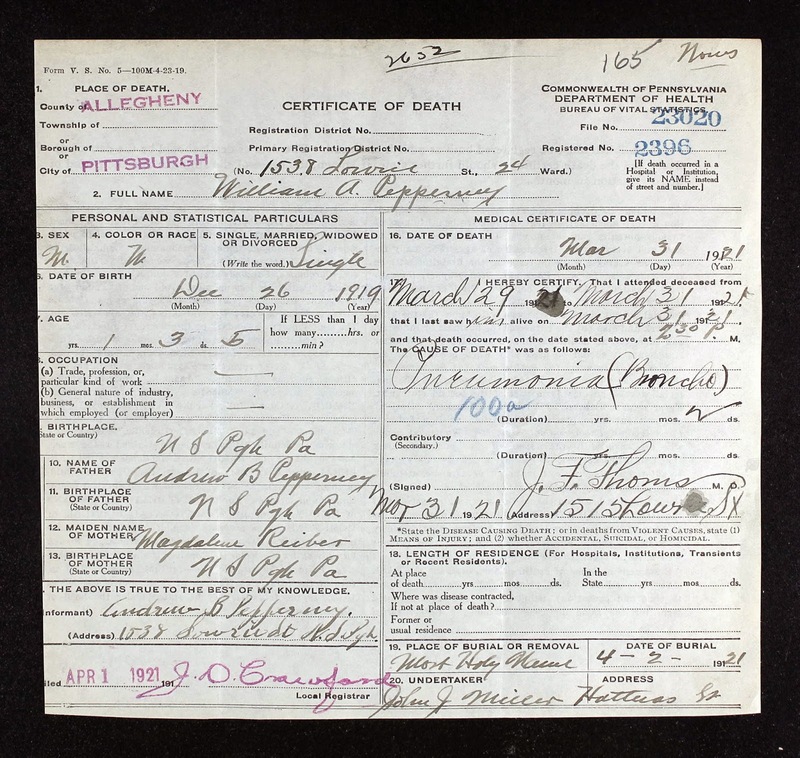 Pennsylvania Department of Health, “Pennsylvania, Death Certificates, 1906-1944,” database, Ancestry.com (http://www.ancestry.com: accessed 19 Oct 2014), entry for William Pepperney Jr, record 23020 (31 Mar 1921).